Hiya guys! Happy 4th of July, for those who celebrate of course. All week I have been wanting to share some holiday appropriate manis, but could not find the time to sit down and do them. I mean seriously, watermarble? Goodbye two hours of my night and nothing but fails to show for it. And then that got me thinking, I can't be the only one pressed for time before going out to celebrate, right?! So that's why today I'll be sharing with you four easy - but definitely cute - manis to do for the 4th of July! Each one of these designs I'll be showing you today can be done in 15 minutes or less! Remember that fast-drying topcoat and you'll be well on your way to enjoying some delicious BBQ food in no time. Waterfalls nails are always a classic nail art look that's so easy to do. 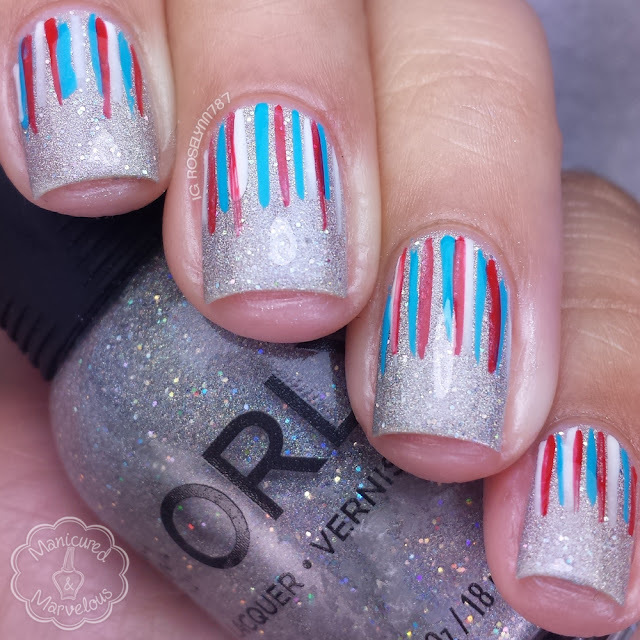 All you need to accomplish this look is three striper colors (red, white, and blue) and a silver glitter base. The base I am using here is the always gorgeous Mirrorball by Orly and the stripers are no-named bottles I picked up from Walmart years ago. After you paint your nails with your base color, take one of the stripers and paint three lines from the top part of your nail going down. The lines don't have to be straight or even, just make sure you leave space after each one so you can fit other colors in-between. Then repeat the same step with the other two colors individually. Seal in your design with a glossy topcoat and that's it! The best part about this polka dot design is how interchangeable all the colors can be. 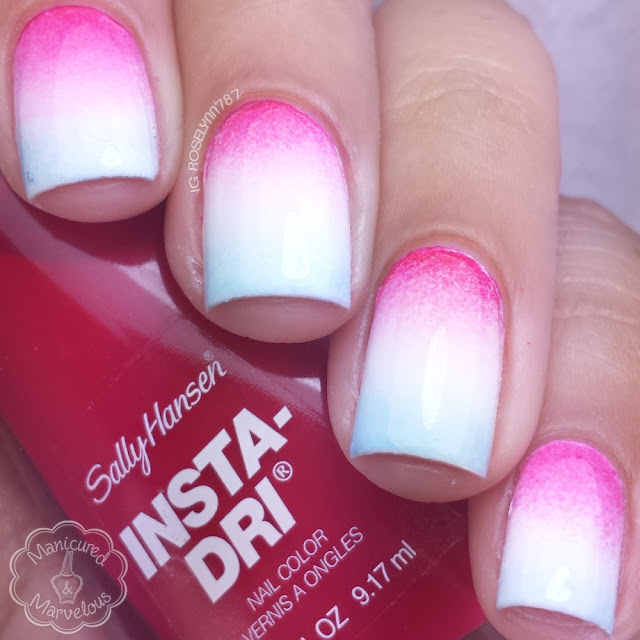 You could easily do red and blue dots over a white base for a cute look as well. Not to mention it's super easy to match your toes if you're wearing flip-flops! 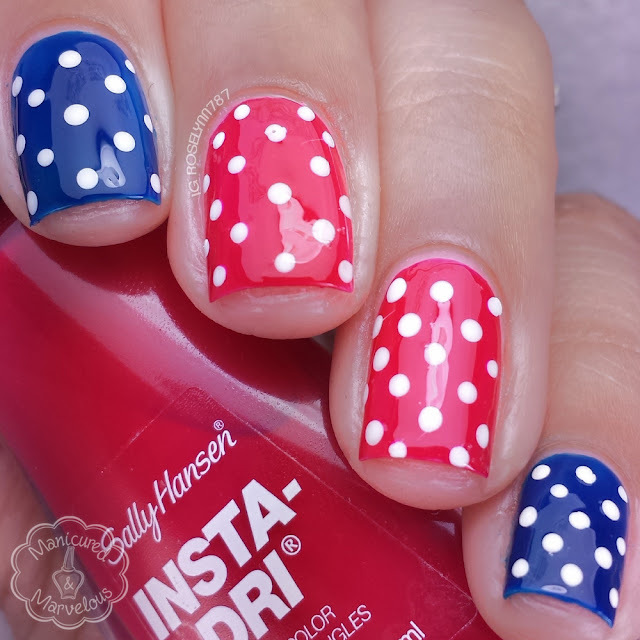 For this look all you need is a red, white, and blue polish along with a dotting tool. I am using Sally Hansen's Tag, You're It and Quick Brick for the red and white. The navy blue color is called Oh Say Can You See from LOOK Nail Polish. I always get asked how my dotticure always come out so clean and the answer is simple. Clean your dotting tool after each dot! When you let the polish build it causes the polish to become stringy or the dots to become distorted. Also make sure you give those dots a little drying time so that you don't smear when you add your topcoat! You know that fan brush we usually toss aside cause it doesn't seem like fun to use? I finally put mine to work as I tried out my very first fan brush mani. The concept is simple, take your fan brush and dip the tips into some polish. Then make sure you take your brush and swipe left to right until you have the desired outcome. I created mine using a white base coat, a red for my index nail, and a light blue for the rest. These three shades are from the Sally Hansen Insta-Dri collection I swatched earlier this week. Now you could totally stop there, but I went ahead and added some cute patriotic glitters from Salon Perfect! And, of course, we can never ever go wrong with a gradient. As soon as I swatched the three Sally Hansen Insta-Dri colors released this week I knew I had to use them for this. The colors are too luscious and bright to resist, am I right?! I don't know if it's because I have done so many in my time, but I always find gradients to be ridiculously fast and easy. Ten minutes flat and I was done and out the door. Some tips to make sure you have just as easy of a time: liquid latex, use a slightly damp sponge, and don't overload the sponge with polish. I end up preferring to use a dabbing motion rather than a rolling one, but either one should work fine. 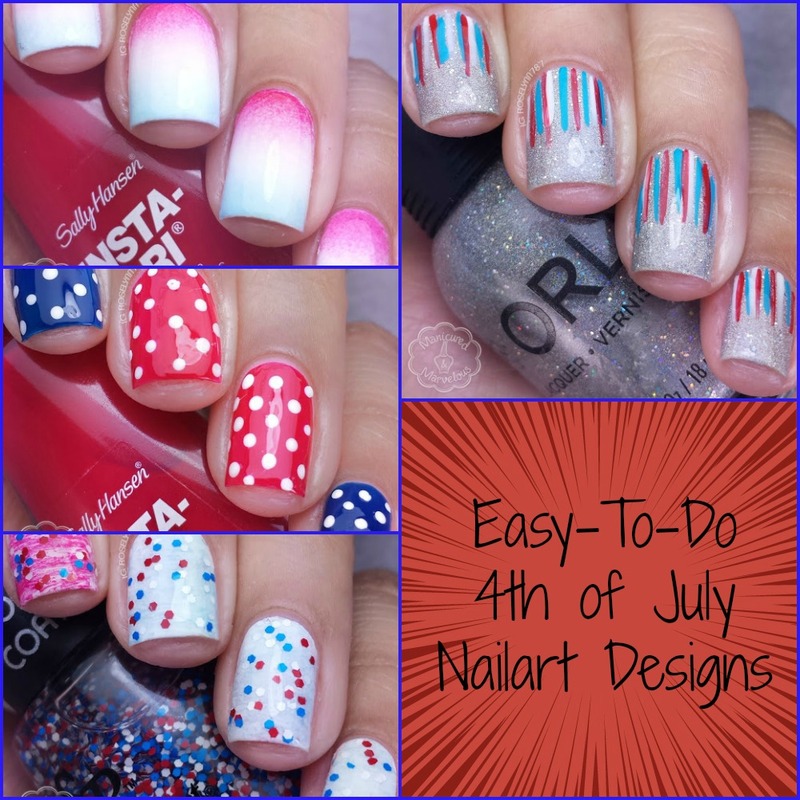 Optional: Add some Fairy Dust by China Glaze or some patriotic glitters over your gradient! This also works great if maybe you have some small imperfections you want to hide. And that's all I have to share! I really hope you guys enjoyed these nail art looks and hopefully have some time to recreate them before going out to celebrate. Stay safe and hope you guys have a wonderful weekend! I'm off to enjoy some delicious hamburgers under the sun with some fried oreos for dessert! I love them! Cant beat a festive and fast but adorable manicure! And then 4 of them, yes please! Thanks a lot I'm glad you like them. I'm always in a rush so I can't think of anything I do that isn't fast lol. all are super cute! I love the waterfall and polka dot ones!! Thanks Chey! The waterfall one was so much fun, I wore it all weekend long. Thanks. The dotticure is always a favorite of mine, simple and clean! These are really nice and easy. Sometimes fussing with a mani just feels like too much and these are a long of impact for the time invested. Exactly! I really didn't want to spend three hours on a mani just for it to chip off the next day. Cute looks! I still haven't done a fan brush mani, and I never would have thought to do one for the 4th of July. As much as I love the look of more complicated nail art designs, I get irritated with the time to both plan and execute, and then it's time to move on to the next. There is definitely something to be said for simplicity! I was fiddling my thumbs thinking of what to do and had a fan brush right next to me so I thought why not! Haha. I need to start doing simple more often, I spend way too much overthinking manis. I'm a fan of a good classic polka-dot. Love that mani! Ditto, I definitely am as well.